So you've heard the saying about seeing the world through rose-coloured glasses, but it turns out the world looks pretty great through yellow and blue lenses too. Left and right we're seeing celebs and style stars alike adopting sunglasses with lenses that go above and beyond basic black. 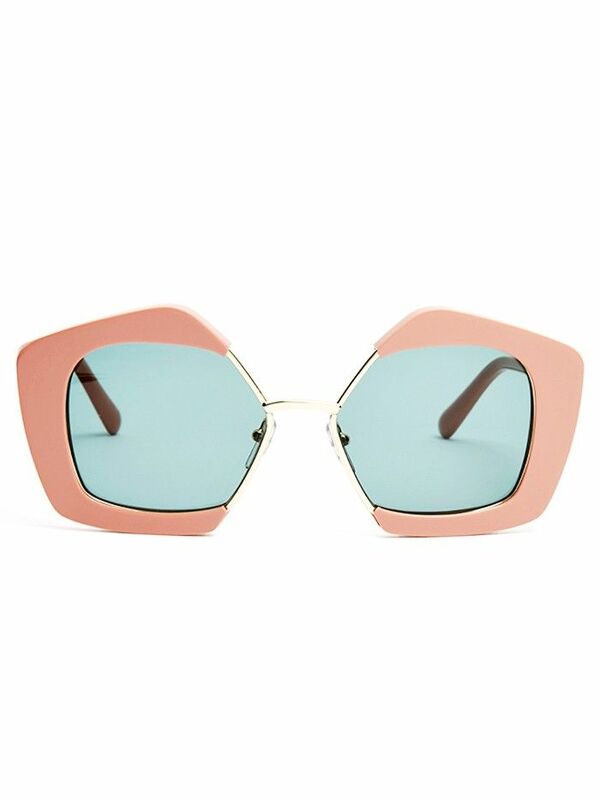 Our first thought is that it immediately reminds us of the pink and blue lenses Mary-Kate and Ashley Olsen wore during their Billboard Dad days (sure). But in 2016, the look is just a little different. While for some, the look is meant to add a certain element of irony and irreverence to an ensemble (a concept perfected by Vetements), as the style's popularity has grown, it's no longer feeling quite so off-kilter. In fact, we're betting you can make the right pair work with just about any ensemble. To convince you of such, we rounded up a handful of our favourite inspiration shots of late, each of which will prove that a vibrant pair of sunglasses is exactly the style you need to finish out the sunny summer in style. Ready for things to get colourful? Read on to see and shop coloured sunglass trend. Bella Hadid made the case for a cool pair of blue shades. Style blogger Zanita Whittington paired yellow aviators with a neutral-coloured silk top. For a fun spin on the trend, pair pink glasses with a bold red lip à la Rita Ora. Kendall Jenner's round frames are a modern spin on the trend. Gigi Hadid coordinated her glasses with the stripes on her Tommy Hilfiger bomber jacket. This street style look combined a casual ensemble with standout shades. These yellow frames stood out against a monochrome look. Chiara Ferragni made the case for pale pink sunglasses. Elle Fanning's pretty sunglasses matched her dress and bold Gucci handbag. Here's a fun way to wear yellow on yellow for summer. These deep blue lenses are a fresh alternative to traditional black. Try clear-framed yellow lenses for a unique twist. We're head over heels for these rimless flat-lens glasses. These angular aviators take the classics to a new level. Wear these oversize Gucci frames with a vintage dress for a grandma-approved look. A little hint of pink adds oomph to any outfit. Pair purple sunnies with a white dress or denim cutoffs. The slight gradation on these lenses is an interesting twist. Swap your usual statement glasses for these blue frames. Surf aviators are ideal for a trip to the beach. See the world through rose-coloured glasses, for real. We think these fun sunnies are perfect for a pool day. Talk about the ultimate statement lenses. Want to see more sunglasses? Check out our guide to the best styles this season. Opening Image: Everett Collection/Warner Bros.